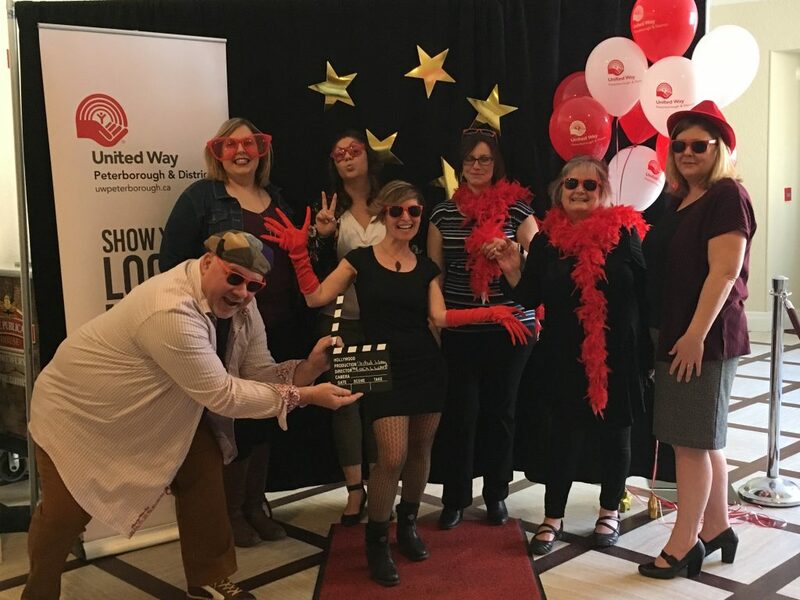 PETERBOROUGH, ON – The Red Carpet was rolled out and the stars of Peterborough packed the sold-out United Way annual Campaign celebration today in the Nexicom studio at Showplace Performance Centre. Highlights of the celebration included a walk down a red carpet, and a paparazzi photo booth, where red boas, red sunglasses, and red fedoras were donned for pictures. In addition, seven short films all produced and directed by Murphy entitled 50 People One Peterborough, played during the lunch which was provided by, By the Bridge Catering. Murphy, born and raised in Peterborough, is a renowned actor and documentary film maker who brought her directorial eye to this year’s campaign, emphasizing the “power of story”. Each film started with a single question, such as “what does home mean to you.” Reactions were thoughtful, funny, heartbreaking, life affirming, and always a reminder of the deep humanity in us all. A guerilla campaign called “Chalk Talk” was marked by four large chalk boards placed in various locations throughout the city. Each board had a conversation starter, such as “I’m Inspired By…” and people were invited to chalk up their ideas and reactions. This year was a show of 100% Local Love. An effusive Jim Russell, CEO of the United Way of Peterborough and District announced that this year’s campaign achieved, $1,735,000. A sea of red signs with the name of every partner and project was held up to demonstrate the breadth of investment across the sector and community. The 2019 Campaign Chair will be announced on April 4th. ← Scholfield Award 2019 Nominations Now Open!